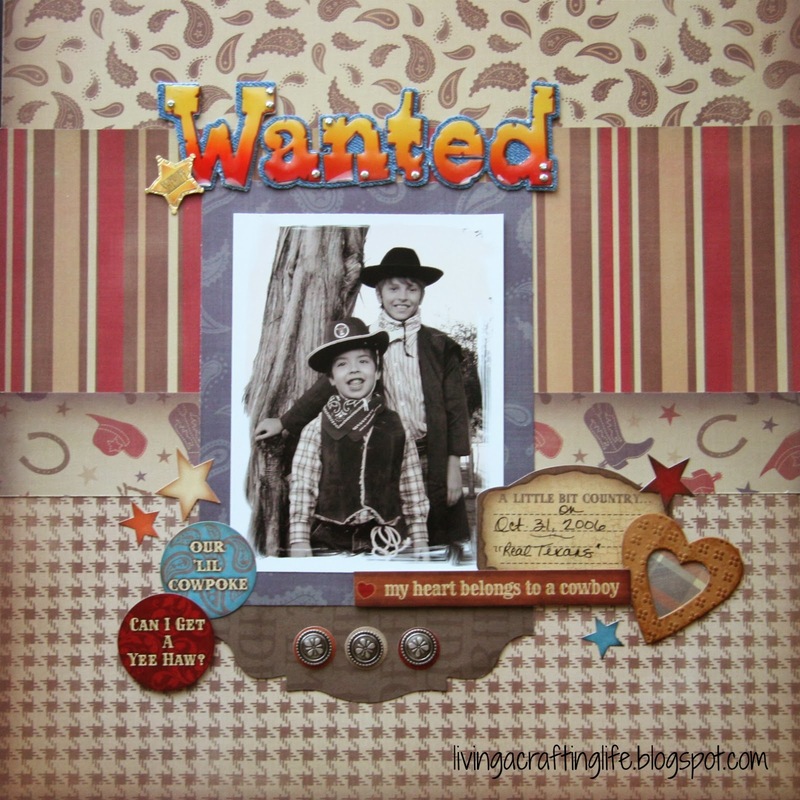 Living a Crafting Life: Throwback Thursday: Yee-Haw with Creative Imaginations! Throwback Thursday: Yee-Haw with Creative Imaginations! Today I am highlighting a couple finished pages that fit in well with "Throwback Thursday". Both of these layouts use an older collection from Creative Imaginations with a matching sticker sheet. I found some chipboard and brads from my stash that went well with the "western" theme, in addition to some distressed looking flowers that I made. This first one is a Halloween photo of my boys from 2006 (they were 9 and 4 years) with special photo effects to make it look a little more vintage. Next is a Throwback-Throwback Thursday layout! The photo is actually me in the early 80s, when the western style was so popular! Because the photo was so small, I kept the area tight with the embellishments and layers so that the photo would stand out. 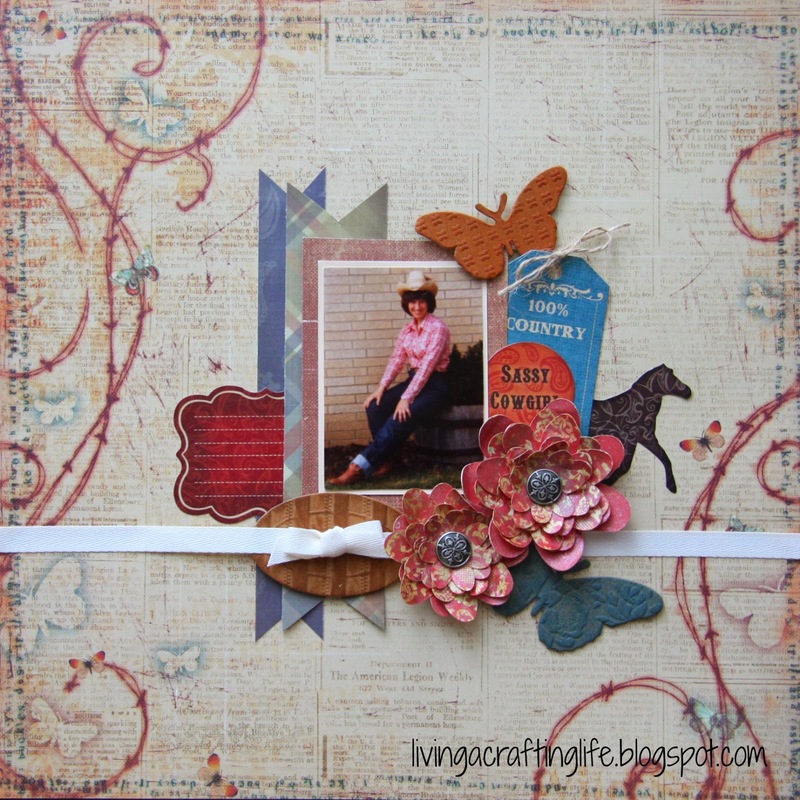 Distressed inks were used on the chipboard butterflies and buckle. This was the first time I have completed a layout with just one, very small photo and although it was a challenge, I am very pleased at how it turned out. (Check out YouTube later this month for a "Layout Share" of some of my favorite "Throwback Thursday" layouts! There will be another "Throwback Thursday" on December 5th, with something from Little Yellow Bicycle. Thanks for visiting! See you next time!